On the 13th June 2016, Maureen Minchin, medical historian, health educator, and author of Breastfeeding matters: what we need to know about infant feeding, spoke at St George’s to dieticians, health visitors, public health, GPs, researchers, IBCLCs (International Board Certified Lactation Consultants), midwives about the science and history of infant feeding. The room was packed and people were enthralled with her delivery of research and evidence showing the inter-generational impact of infant feeding practices. She spoke of the necessity of breast milk for normal human development and how breast milk is the bridge from womb to world. Maureen and the GP infant feeding network (GPIFN) kindly donated a signed copy of her latest book Milk Matters: infant feeding and immune disorder to St George’s Library. 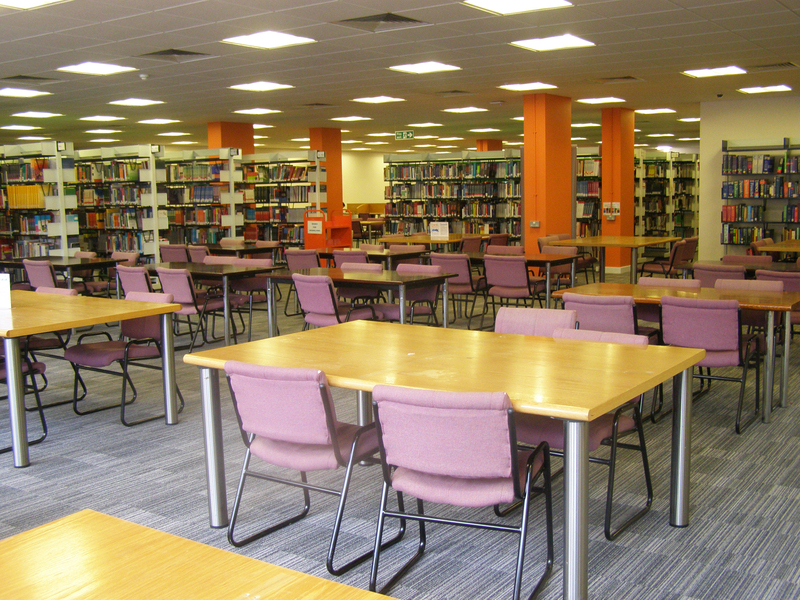 Over the Bank Holiday weekend we replaced the furniture in the Group Study Space (orange zone). We have listened to your feedback about the new furniture, and have brought back some of the rectangular tables whilst we purchase more large round tables to improve this space and increase seating capacity. 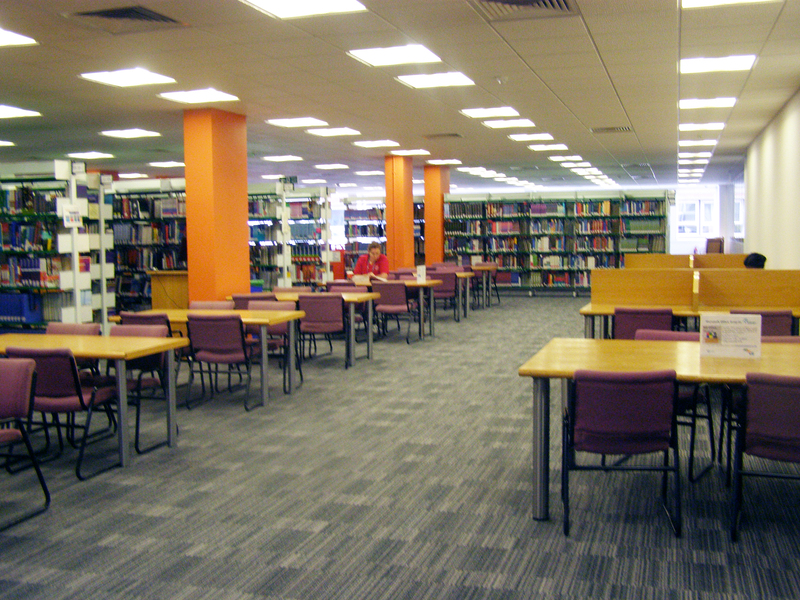 The new round tables were put into the Library Group Study space, with the intention of creating more appropriate space for groups to study. This was following feedback from students in our recent survey. Please use the silent study spaces (blue zone) at the back of the Library if you need more space or a quieter environment. Women medics and the First World War. ‘Among the many sorrowful effects which the War has had upon us it is pleasant to record one joyful result which we would never have attained without a war. Variety and charm has been added to the Medical School and its works by the admission of ladies as students’ (St George’s Hospital Gazette, April, 1915). Despite this initial enthusiasm, fears of controversy led to these places being rescinded. The female students were impelled to write and plead their cases. In 1916 the medical school acquiesced and allowed them to continue their studies. This indicates that medical training for women remained a contentious issue. By 1917 however, St George’s was prepared to even employ women, albeit temporarily, as house officers. Two of St George’s first female medical students (St George’s archive). Irregardless of the medical school women graduated from, they were still confronted by a scarcity of available positions. Most found themselves limited to work in women’s hospitals, moving to obscure geographical locations or adopting specialities that did not generally appeal to men. When the First World War broke out there was no official interest in involving qualified female doctors in the war effort. When Dr Elsie Inglis attempted to volunteer, the infamous War Office response was ‘My good lady, go home and sit still’. This was unlikely to ever happen; Dr Inglis like others had been involved in the suffrage movement. Women doctors simply approached their campaign to help the war effort in the same way they had fought for voting rights. They mobilised support, formed voluntary groups and raised money. In effect they simply circumvented officialdom and offered their services elsewhere, even to foreign governments. 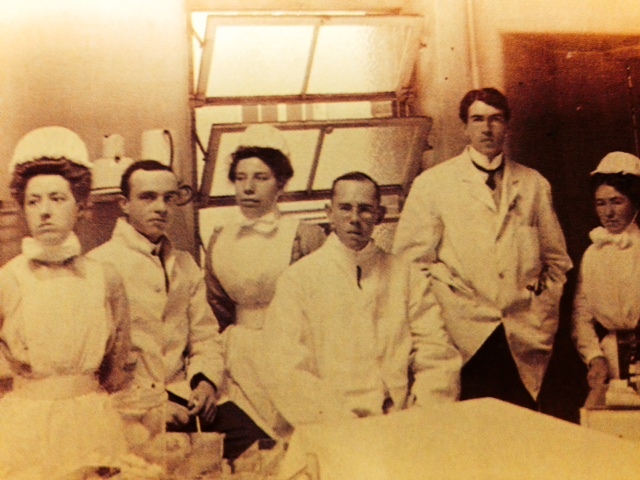 In 1914 the Women’s Hospital Corps was formed by Dr Louisa Garrett Anderson and Dr Flora Murray. The French government, unlike their British counterparts, promptly accepted their offer of help. Under the aegis of the French Red Cross the Women’s Medical Corp successfully ran military hospitals in Paris and Boulogne. In Paris they occupied the newly built Claridge’s Hotel on the Champs Elysee. The organisational skills required to raise funds, recruit staff, design uniforms and equip and manage the hospital were considerable. But both women were experienced doctors and had been active suffragettes, Dr Garrett Anderson herself had even been imprisoned in Holloway. They must have been formidable; the concierge told Dr Garratt Anderson that ‘he would have had an easier time fighting the Germans than facing so many active English Ladies!’ (Papers of Louisa Garrett Anderson,1914). 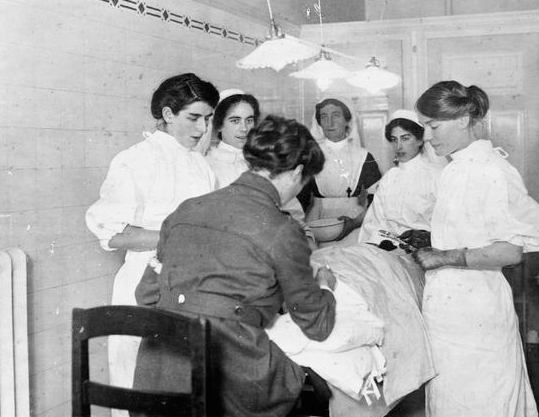 Flora Murray supervising an operation at the Paris Red Cross Women’s Hospital (image courtesy of the Imperial War Museum). 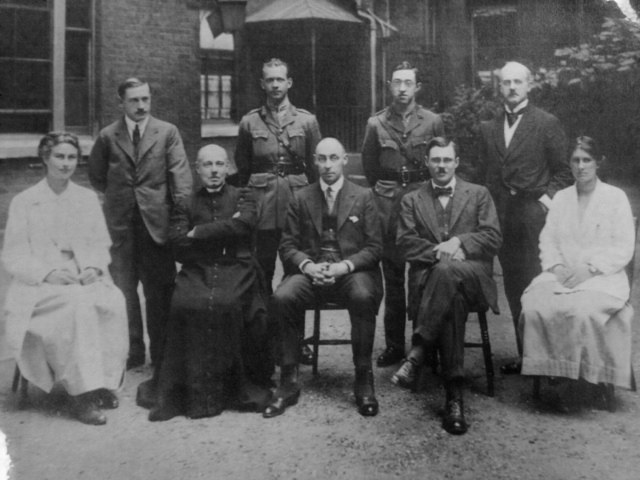 In 1915, ostensibly to free men for service, the Corps was given control of the Endell Street Hospital in London which treated over 25,000 patients during the duration of the war (Murray, 1920). The Scottish Women’s Hospital, which had been formed by Dr Elsie Inglis after her War Office rebuff, distinguished itself in Serbia and France in 1916. In Serbia, the all female staff of the hospital found themselves in the midst of the conflict treating serious injuries in extremely difficult conditions. Moreover they had to fight major epidemics of disease and deal with a starving civilian population. The Hospital’s volunteers were forced to join the retreat during which thousands died. Some chose to take the even more risky option of staying behind with patients who could not be moved. Dr Inglis herself was taken prisoner of war. In that same year, in the light of escalating need, the War Office reconsidered their positions and grudgingly allowed female doctors and surgeons to join the services. Despite the efficiency of the Women’s Medical Corps and the sheer toughness of the Scottish Women’s Hospitals the authorities continued to refuse to countenance the idea of women near the battlefield. Instead volunteer medics were sent to locations like Malta. This was located far from the fighting and most of the patients there were being treated for malaria and other infectious diseases. The Newnham and Girton units of the Scottish Women’s Hospitals about to leave for Serbia in 1915 (image courtesy of the Royal College of Physicians and Surgeons of Glasgow). ‘I am in the theatre from 2 – 9 or 10 at night and eight or more [operations] The cases come to us very septic and the wounds are terrible. Today we are having an amput’ of thigh, two head cases perhaps trephine and five smaller ones’ (Papers of Louisa Garrett Anderson, 1914) . ‘Although many of the medical women in the army not only have a high professional standing in civil practice, but now have a large experience in military hospitals, they rank below the latest joined R.A.M.C. subaltern, and are obliged to take their orders from him. When they travel, they travel not as officers but as soldiers wives’ (Times, 1918). Whilst women’s’ suffrage had been put on hold for the duration of the war the Medical Women’s Federation decided to challenge this inequality robustly. A number of reasons for treating women in an inferior manner were put forward. Some feared it would be the thin edge of the wedge and that women serving elsewhere in the forces might also want commissions. The military were by nature conservative and some in it’s ranks had no sympathy for claims of sexual equality. Perhaps the oddest objection was that the ordinary soldier would not bear examination by female medics or tolerate treatment of venereal disease. This, despite the fact that female nurses dealt with cases of venereal disease and had continual intimate contact with patients. A doctor was traditionally a masculine authoritarian role and it was felt men might resent being told what to do by a woman. A famous Punch cartoon of 1915 shows a stern looking female doctor recognising a patient. The patient cheerfully points out that as a police constable before the war he had once arrested her in her guise as suffragette. There appear however to have been few examples of any complaints from patients at being treated by a female surgeon or medic. The women run hospitals were, in fact, considered to be far more pleasant places to be than many official alternatives. Ward round at Endell Street hospital (image courtesy of bbc. co). ‘Commissions have been given to numbers of medical men who by reason of physical disability or age were not fit for service’ (Contemporary Medical Archives Centre). The War Office however maintained that a man unfit for full service was still more able to serve than an able bodied woman. In 1919 the Medical Women’s Federation declared that in future it would advise it’s members never to volunteer for any emergency, unless they were treated in the same way as the men. Despite finally being granted limited suffrage in 1918, many female army medics found themselves rapidly demoted back the backwoods of hospital medicine, but not all. Some helped found famous hospitals and others became leading figures in their fields. Notably however, few were allowed to continue to practice as surgeons, where their greatest expertise and experience lay. ‘… they proved an enthusiastic and efficient body. Most of them became house officers in their turn. Some occupied the higher posts of assistant curator and pathologist with such signal success that their services were retained long after the war had ceased. No more women students were admitted, however, as soon as it became plain that we were getting enough men to fill all the necessary posts in due course. The school is not big enough to harbour women as long as it continues its present prosperity with men’ (Blomfield, p. 92). 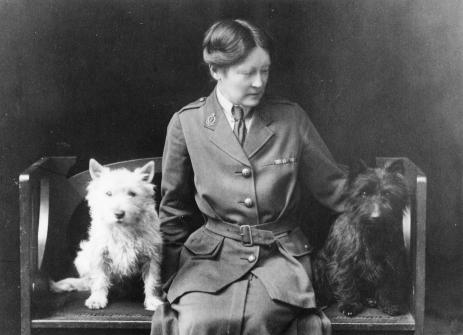 The War Office in fact continued its stance until the Second World War became imminent when again a generation of female doctors and surgeons would be called upon. That generation however were even less inclined to tolerate the inequalities their predecessors had been but even then they were only granted ‘relative’ rank and often denied commissions. Blomfield, J. (1933) St George’s: 1733-1933. London: The Medici Society. SA/MWF/C.163. Contemporary Medical Archives Centre, Wellcome Trust. Leneman, L. (1933) ‘ Medical Women in the first world war-ranking nowhere’, British Medical Journal, 307 (December) pp.1592 – 1594. Murray, F. (1920) Women as army surgeons. London: Hodder and Stoughton. Papers of Louisa Garrett Anderson, The Women’s Library, London. St George’s Hospital Gazette, 1915. The Times Letters page, The Times, 4 July. Nursing and the First World War. ‘at present nursing is the last resource of female adversity. Slatternly widows, runaway wives, servants out of place, women bankrupt of fame or fortune from whatever cause, fall back on hospital nursing‘ (Gaffney, 1982, p.140). In 1867 Florence Nightingale dismissed her predecessors as: ‘those who were too old, too weak, too drunken, too dirty, too stupid or too bad to do anything else‘ (Gaffney, 1982, p. 194). Barnard, F. (1874) Mrs. Gamp, on the Art of Nursing. 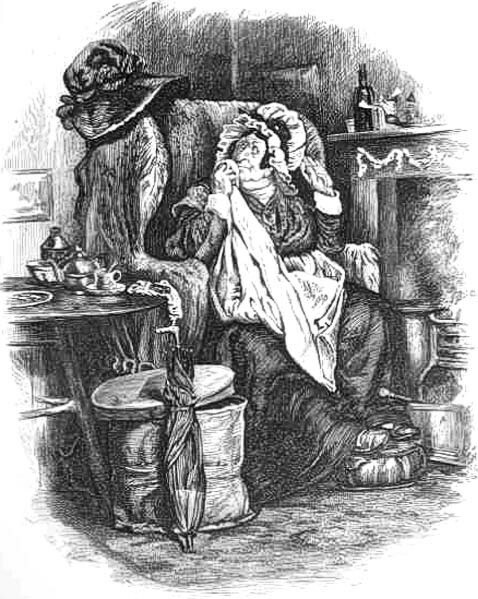 This image depicts Dickens’ dissolute, drunken and slovenly stereotype of the early Victorian nurse. Nursing often involved close physical contact with strangers. This, combined with the cleaning and feeding elements of the role, led to it being regarded as somewhat degrading and thus unsuitable for respectable women. Furthermore, a social stigma attached itself to any woman required to work for a living rather than being supported by her husband or family. As the 19th century advanced however, the social class of hospital patients had begun to diversify. Advances in surgery and care at hospitals resulted in the presence of patients who had previously been tended to at home under the management of personal physicians. This, along with developments in medical science and technology, fuelled the demand for skilled presentable nurses. Professional nurses at George’s circa 1900 (St George’s archive). By 1914 there were an estimated 12,000 nursing personnel with some kind of recognised training in Britain (Dingwall, Rafferty and Webster, 1988, p. 47). Such training might have included lectures in pharmaceuticals, hygiene, anatomy and nutrition. There was also plenty of work available as hospitals expanded and new ones opened but there remained no recognised formal skill base. Old prejudices towards the profession lingered and very few middle class women were recruited (Maggs, 1983, p. 47). Nurses, who were largely drawn from respectable working class backgrounds, regarded themselves as educated and genteel. Nursing itself however, remained a new and vulnerable profession. 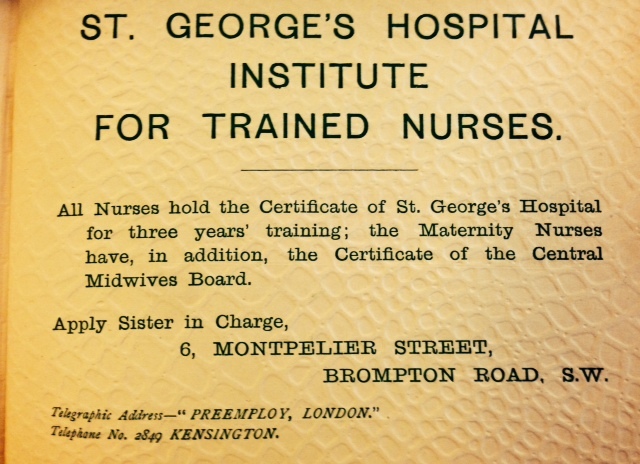 Advertisement for St George’s Hospital Institute for trained nurses (St George’s Hospital Gazette, May 1914). Nurses operated within a regimented, hierarchical system with their status demarcated by their uniform and experience. They were expected to be obedient and calm under pressure. Most would have had experience of treating wounds and infections. To modern eyes it seems surprising therefore that they were not immediately acknowledged as an indispensable resource in fighting the war. However 1914 Britain remained a patriarchal culture and there was a resistance to placing women anywhere near the fighting. Nurses were therefore initially regarded as being most useful where they could free able-bodied men for service. 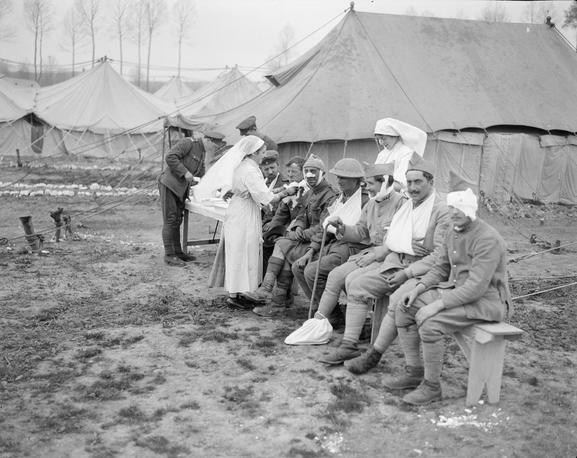 Nevertheless due to the sheer numbers of wounded being evacuated from the front, it rapidly became clear that professional nurses were urgently required as close to the battlefields as possible. 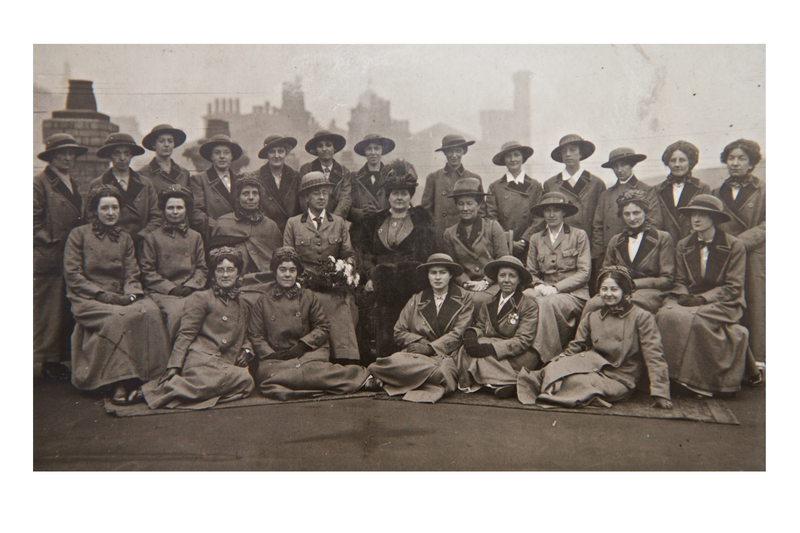 Photograph of St George’s nurses taken close to 1914 (St George’s archive). 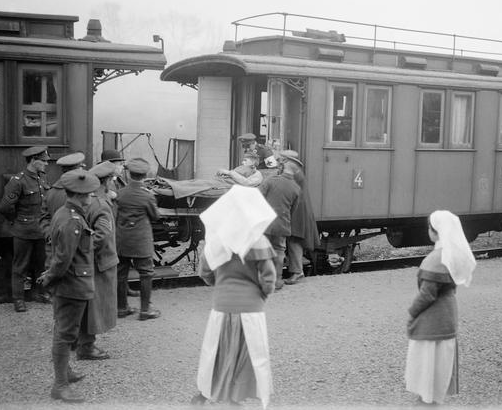 As the casualties mounted it also became apparent that the number of nurses deployed was, in fact, grossly insufficient. Voluntary Aid Detachment Workers (VADs) were recruited to carry out the auxiliary, unskilled parts of the job such as laundering, cleaning and applying basic dressings. It was dirty, challenging work yet paradoxically recruits were usually drafted from the middle and upper classes. This was partially because the other opportunities to aid the war effort such as work in munitions factories were considered socially unacceptable. 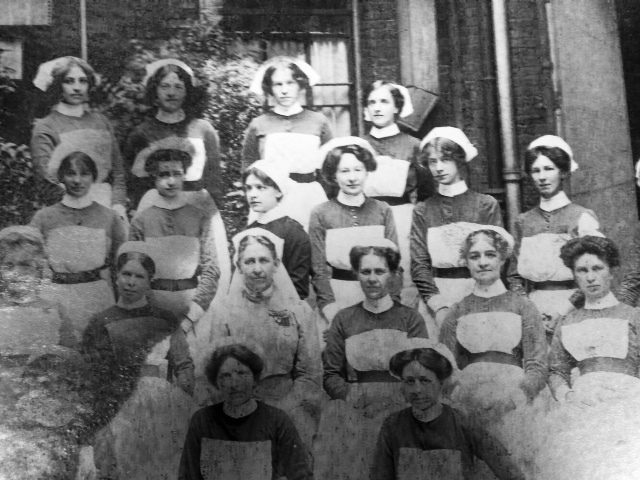 There was also a perception that these young women were, due to their class and temperament, ‘natural’ nurses. Providing light care to the poor and elderly had long been considered appropriate pastimes for wealthy young women, as long as they did so out of charity rather than the need to earn a wage. VADs received a salary but were expected to pay for their uniforms and basic training themselves. Dennys, J. 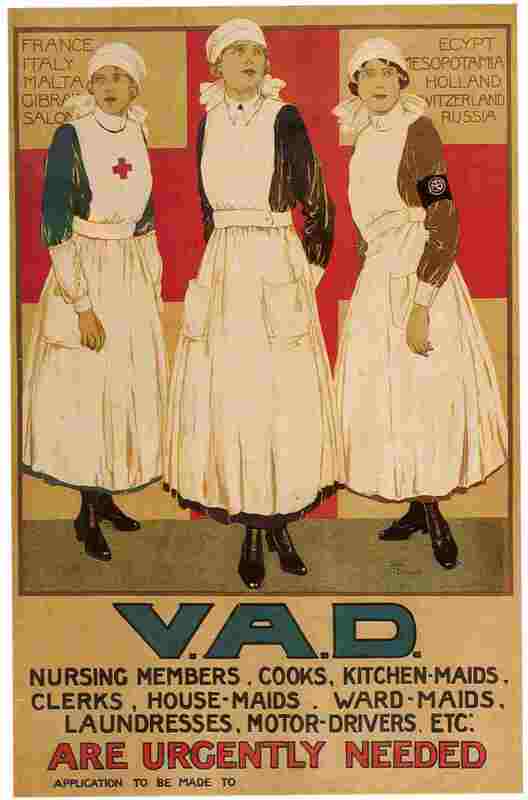 (1915) VAD Recruitment poster (image courtesy of the Imperial War Museum). As a consequence professional nurses found themselves cast in the role of manager and educator of VADs alongside their nursing duties. Moreover they had to supervise women from higher echelons of society than themselves and may have felt threatened by this influx of unskilled labour. This caused some friction. The professional nurses were occasionally irritated by the sense of entitlement of young, untrained women whom after the war would naturally occupy higher social positions than them. The volunteers in turn, unused to the discipline of the nursing system sometimes found their supervisors harsh and disciplinarian (Hallett, 2014). The VADs however, generally admired the professionalism and skills of their seniors and more often than not the challenges of dealing with the dying and wounded brought them together. The VADs’ contribution was essential and many finished the war as highly capable nurses (Hallett, 2014). 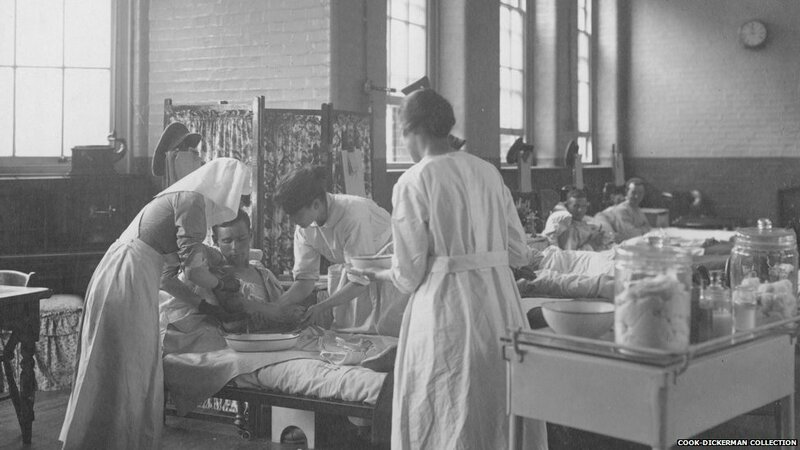 ‘In the wards there were rows of stretchers with brown blankets only and on bare floors…There were no trolleys or dressing tables, an empty petrol can served for the soiled dressings and a clean piece of paper as a tray for the soiled dressings, and the floor or next stretcher for a table. The cases, acute and light, were all mixed in the same ward.’ (McCarthy, 1919). Nurses also had to cope with brutal injuries and aggressive infections. Their work included carefully removing shrapnel, irrigating wounds and cutting away infected tissue; activities that more closely resembled surgery than nursing care. Due to the heavily manured soil in Belgium and France many soldiers succumbed to tetanus and gangrene, the only practical treatment for which was often amputation. Anaesthetics and pain medication could be scarce; nurses would work on wounds as orderlies forcibly held patients down. The term ‘triage’ was popularised during the First World War. Nurses found themselves making decisions that would have dramatic and lasting effects upon their patients’ lives. ‘Poor things burnt and blistered all over with great mustard-coloured blisters, with blind eyes… all sticky and stuck together, always fighting for breath, with voices a mere whisper, saying that their throats are closing and they know they will choke’ (Blodgett, 2009). British nurses watching a German patient being handed over in 1919 (image courtesy of the Imperial War Museum). Hospitals such as St George’s continued to deal with the effects of the war long after the armistice in November 1918. Amputees and those poisoned by gas or suffering from disfiguring injuries required continuing care. Nonetheless, demobilisation and the closure of military hospitals naturally led to a dramatic reduction in the need for nurses, leading to a sudden loss of employment and income for many. This particularly affected married women who could no longer serve after the war (Dean, 2012). Many nurses returned to their pre-war lives but the war had provided not only horrors but opportunities. Some had travelled to places they had never imagined visiting and experienced freedoms and responsibilities they would never have been granted before 1914. It had a lasting effect on many. Agatha Christie, for example, served as a VAD and was able to qualify as a pharmaceutical dispenser after the war. Many of her novels would subsequently feature death by poisoning. Her most famous detective, Hercule Poirot, was a Belgian refugee from the war. 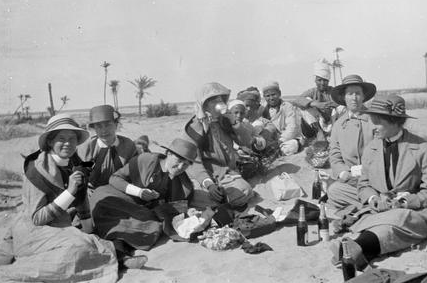 Nurses having a picnic in Egypt (image courtesy of the Imperial War Museum). ‘The high standard demanded at St. George’s has given her nurses a reputation second to none’ (Blomfield, 1933, p.103). Barnard, F. (1879) Mrs. Gamp, on the Art of Nursing [Pen and Ink]. Available at: http://commons.wikimedia.org/wiki/File:Fred_Barnard00.jpg (Accessed: 4 November 2014). Blodgett, B. (2009) ‘Germany’s use of chemical warfare in World War I’, First world war.com, Available at: http://www.firstworldwar.com/features/chemical_warfare.htm (Accessed: 4 November 2014). Blomfield, J. (1933) St George’s 1733 – 1933. London: The Medici Society. Dingwall, Robert, Anne Marie Rafferty, Charles Webster, eds. (1988) An Introduction to the Social History of Nursing. London: Routledge. Gaffney, R. (1982) ‘ Women as Doctors and Nurses’, in Checkland, O. and Lamb, M. (eds.) Health Care as Social History. Aberdeen: Aberdeen University Press pp. 134–148. Hallett, C. (2014) ‘A very valuable fusion of classes’: British professional and volunteer nurses of the First World War.’ Endeavour, 38 (2), pp: 101 – 109. Hallett, C. (2014) ‘Stoicism and care in the face of carnage’ Nursing Standard, 28(48). Imperial War Museum. Collections and Research. http://www.iwm.org.uk/collections-research . Lomas, C. (2014) ‘In the thick of it’, Nursing Standard, 28 (24) pp: 20-22. Maggs, C.J (1983) The Origins of General Nursing. London: Croom Helm. Mc Carthy, E. M. Report 31.7.1919. The National Archives WQ222/2134. Available at: http://www.nationalarchives.gov.uk/ (Accessed: 4 November 2014). St George’s Hospital Gazette, July 2014. Thank you for your patience over the summer.